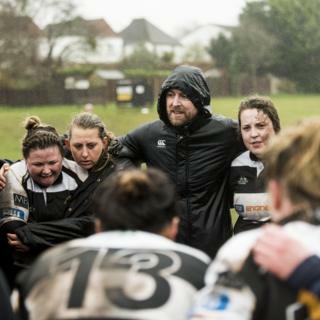 The women of Sutton & Epsom's Ladies RFC are on top of their game having just won the league and been promoted for the second year running following a long unbeaten run in that competition. 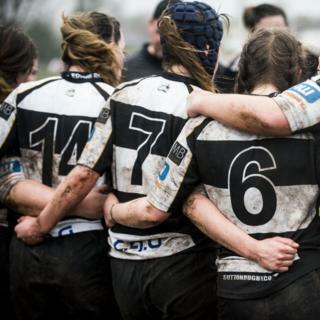 Participation in women's rugby is growing rapidly in the UK with the Rugby Football Union (RFU) planning to have 100,000 women and girls involved in the the sport across England. For some it is the physical workout, and others are drawn by the social side, but the thrill of the game is something all the players feel. 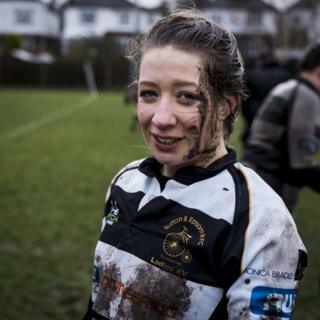 "The initial feeling of scoring a try is like you're under water," says Sutton & Epsom's Jo Evans. "When you break the defence and you put the ball down over the white line, it's like you come up for air and you can hear your team around you, the feeling that you've got those points." Captain Beth Evans knows it is important to believe in their own ability and to trust fellow team-mates and coaching staff, but also to enjoy it. "Rugby to me is the sense of unified purpose that comes along with training hard and pushing each other forward," says Evans. "It allowed me to fit in as I am, with my strengths and weaknesses. 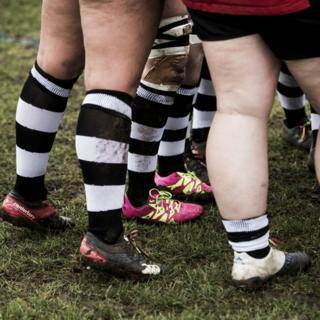 I am one of four sisters who play on the team; I have always been seen as the unfit, larger sister but rugby has a position for all shapes and sizes. "It has helped me become stronger, fearless, and in the process, to find an amazing new family of friends that have become a crucial part of my life. "No matter what the scoreline says, I was taught to never give up, hit harder, press faster and run quicker." 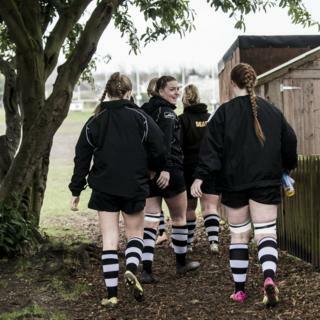 The club itself is one of the oldest active rugby clubs in England, being founded in 1881, although the women's team was conceived 17 years ago when three women who had played at Leeds University approached the chairman with the idea. For the first 10 years or so the team just about managed to put out a team of 15 on a weekly basis with the number of players dipping to only four in 2014. But a handful of women and coaches were determined to rebuild so that the under-18 girls were able to continue playing into adulthood. Recruitment began with complete beginners and newbies to the sport making up the bulk of the team, and that was often reflected in the results, which included a 66-0 defeat to Reading Abbey. Lots of hard work followed, and by the end of the same season the return match finished in a 14-14 draw. Fast forward to today and the ladies team has more than 50 active players, with at least 160 if you include the under-15 and under-18 girls teams. Jenna Parsons is a long-standing team member and first played when there were around six women on the books. "That season was arguably one of the hardest, but it was the season that the team well and truly formed and began to shape what we represent now," says Parsons. "I'm grateful we continued to grow despite losing matches. It's a sport that welcomes people from all walks of life. No matter your gender, age, experience, ability, fitness levels or knowledge, there is always a place for everyone at a rugby club." As well as the first team, there is now a second team and a very healthy youth team, ensuring that new players can take part at many levels and help those returning from injury. "It's also great that we are now in a time where we have girls on the team who have convinced their male partners to start playing because of their new-found love for the game," adds Parsons. "The thriving recognition of women's rugby is, it goes without saying, a huge driving force for our successes. It's onwards and upwards from here." Elle Ross is one of those who joined the team relatively recently, despite in her view not being a "sporty person" and not having played a team sport since leaving school a decade ago. "I'll never forget turning up for my first night at training: I wore a bib to remind people I wasn't ready for contact but still managed to come home with some huge bruises, and I screamed every time I received the ball because I had no idea what to do," says Ross. "But I got 'the bug' that first Tuesday night and haven't looked back since. "I'm proud to say I now make the teamsheet for most first team games as well as second team ones. It's been an absolute whirlwind. "First and foremost, it's helped with my anxiety because it teaches you to switch off. You can't worry about what you look like or what you're doing, you just focus on the now. A perfect respite for an overactive mind." Of course being a contact sport, the game is not without its risks. Ahead of all the matches there is a steady stream of players heading off to see one of Sutton & Epsom's four sports therapists, who between them cover three evening clinics and games at the weekend. "In the ladies' squad, there are a few requiring ankle and knee strapping for a bit of added support following knocks and sprains earlier in the season," says physio Sophie Ward. "But I can't say I've noticed any significant difference between the women and men on game days. In fact, the only one I can think of is that the ladies' changing room smells a whole lot nicer!" Winger Verity Brooker knows what a long-term injury is like, having suffered a ruptured anterior cruciate ligament (ACL) last year, and to complicate matters she was in the final stages of her degree. But seven months later, with the assistance of the physio team and lots of hard work, she was back in action. "It's an injury that has a long, slow recovery and without proper rehab there is a high risk of rerupture," says Brooker. "I couldn't wait to come back, but the consultants are reluctant to allow you to play quicker than their deadline, and rightly so. "I just worked really hard on it, doing everything possible to rebuild my muscle, relearning how to use that knee and refining my skill set once again. If you do the physio properly, the timeline can be different. "My first game back I was really nervous but then I thought to myself I've worked hard, built the muscle back up and it's fine at training, plus it was a freak accident so there's just as much chance of doing my other knee really. I am still working on it but am on a positive path to getting myself back to my full potential." Scrum-half Louise Darby also knows what it is like to battle back from injury, when, after rehabilitation from a serious skiing accident, she was told she would not be able to play contact sport again. 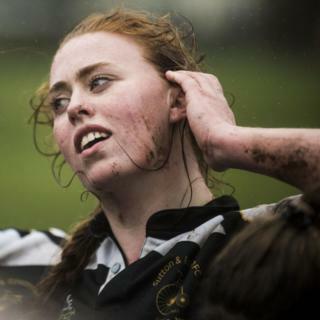 "Rugby first caught my eye at university; the speed and strength of the game and cohesion of team sport were what first attracted me," says Darby. 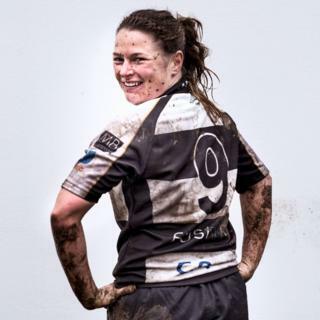 "I lived and breathed rugby whilst playing for Loughborough first XV where I made some lifelong friends, team-mates who I have seen go on to play and captain their respective countries." Following her injury, Darby played Aussie Rules Football (AFL) and has represented Great Britain for five years. While attending the AFL trials, which were held at Sutton & Epsom's ground, she stayed on to watch the international rugby on TV and got talking to members. "I promised to come to one training session and here I am six weeks later," says Darby. "I can't tell you how happy I am to have donned the number nine shirt and to be playing a sport I had once been told I would never play again. So, it's rugby in the winter and AFL in the summer for me for the foreseeable future." Image caption "The feeling when you break through and are about to put the ball down is panic - the little voice in your head saying, 'don't drop this'," says Jayne Meadows. "Then as soon as you put that ball down it switches to joy - you stand up and see your team-mates flying at you with smiles on their faces. It's the best feeling ever." The team is coached by Nick Harris, who has played the game since he was six years old but got into coaching when his son started to play the game,. "I love the challenge of trying to pass on my knowledge and experience in an enjoyable and inspiring way and jumped at the opportunity to coach the ladies' team when it arose three seasons ago," says Harris. "I've seen the team grow in so many ways over the last few years and it's been a pleasure and an honour to be part of it. They've taken ownership of their team and are proud to have their own identity in a club that is inclusive to every member. "It's an exciting time for women's rugby, and I hope that the growth in the sport continues. Rugby has been a huge part of my life, it's rewarding both physically and mentally. I would recommend that anyone becomes involved in the sport - becomes part of a community that will welcome you in with open arms." They play in all weathers and Sophie Small, who plays second row, is just as happy in the wind and rain as on a good day. "The play is slightly slower, there's a lot more ball carrying as opposed to playing through the hands with width," says Small. "They say forwards decide if you win or lose and backs decide by how much, but that all goes out the window in weather like this. It has to be a team effort to get the win. The only downside is more handling errors equal more scrums." At 32, Hanna Al-Khaldi has been playing for 15 years and is often the oldest player in the teams for which she plays. In addition to Sutton & Epsom she turns out for Surrey County and the newly-formed Lebanon women's team, because she is half-Lebanese. "It's a really exciting time for women's rugby, and the opportunities that are out there nowadays are so exciting," she says. "But I love that Lebanon, in particular, is breaking down international views of women's rights and opportunities in the Middle East through an incredible sport." 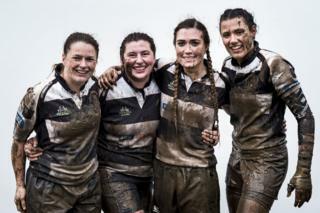 The sport is growing rapidly with new leagues springing to life, but victory in the Women's National Challenge London & SE 1 league for Sutton & Epsom's Ladies RFC seals an amazing turnaround of fortune over the past five years. Back then, because of a lack of players, they were barely able to field a team each week, but this year have sealed promotion. 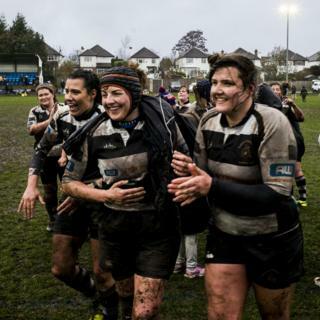 "When I left university to come back home, my dad joked he wouldn't watch me play if I wasn't playing in the Sutton & Epsom black-and-white", says inside centre Alicia Harries. "I knew he wasn't really joking; the club means everything to him after playing for years in his youth, and his stint as captain. Three years down the line I share the exact same love and passion my dad always had for the club. It isn't just a rugby club, it's another family for all of us."